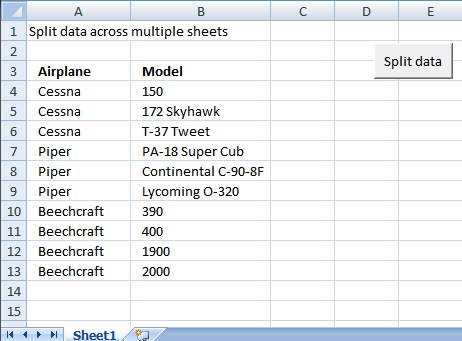 In this post I am going to show how to create a new sheet for each airplane using vba. The macro copies airplane and model values into each new sheet. Do While rng &lt;&gt; ""
Do While Selection &lt;&gt; ""
Remember to enable macros and backup your excel file because you can´t undo macros. 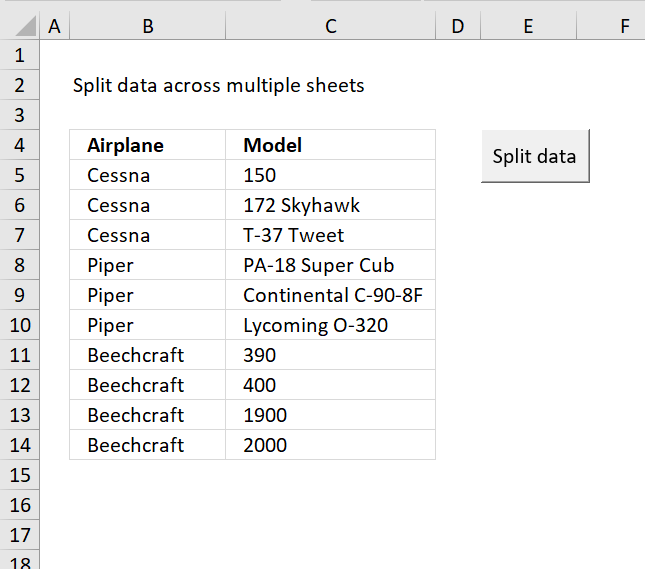 Split data across multiple sheets Add-In for Excel let´s you split/categorize data from a sheet across multiple new sheets. 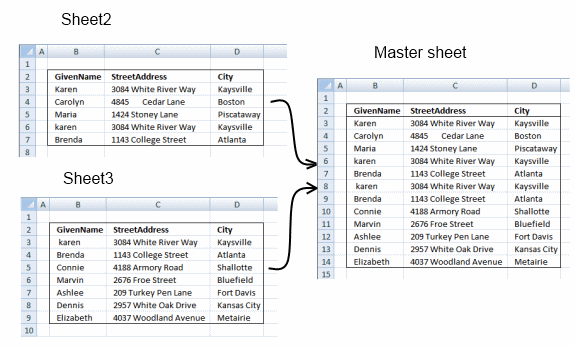 Split data across multiple sheets add-in for Excel *.xlam file. Sure, you have unconditional money back guarantee for 14 days. What about working with merged cells? The add-in won't work with merged cells. Unmerge cells before usage. how would we print the sorted sheet into a new workbook rather than the same? how do we set a range on the column. Say you only wanted to split the information between a4 and a10 rather than between a4 and the very end of the list. Great - worked a charm. this code works well, but the prob is could not able to get the Merge cell as it is.. I don´t have an answer right now. 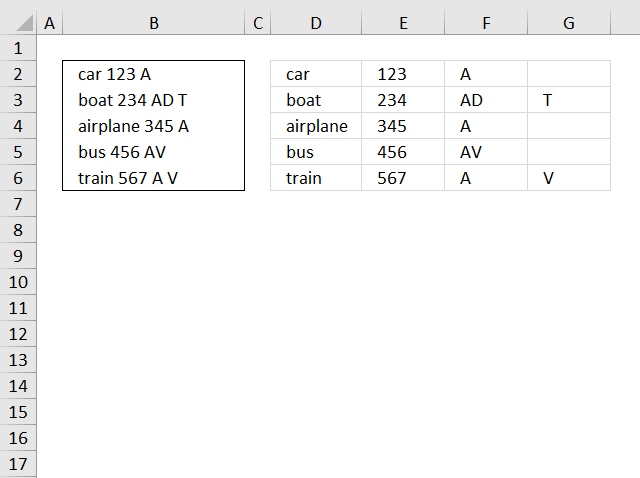 Excel often has problems copying ranges containing merged cells onto sheets with merged cells even if the merged areas are the same. The best solution is to not have merged cells. 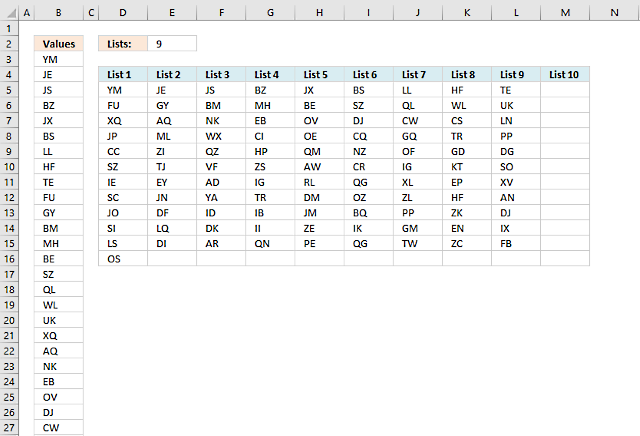 Next best is to unmerge all cells in the range that is to receive the copy before pasting in the new data. Hej.. works...problem is for a huge file.. doesn't. I have a 470k rows and is blocking at some point. Where does it halt and what does the row look like? You can use this contact form. It is really a nice article. I have used it in one of my automation but it goes into loop and never ends. I have to abruptly log off from the system to stop it. Need urgent help on it. 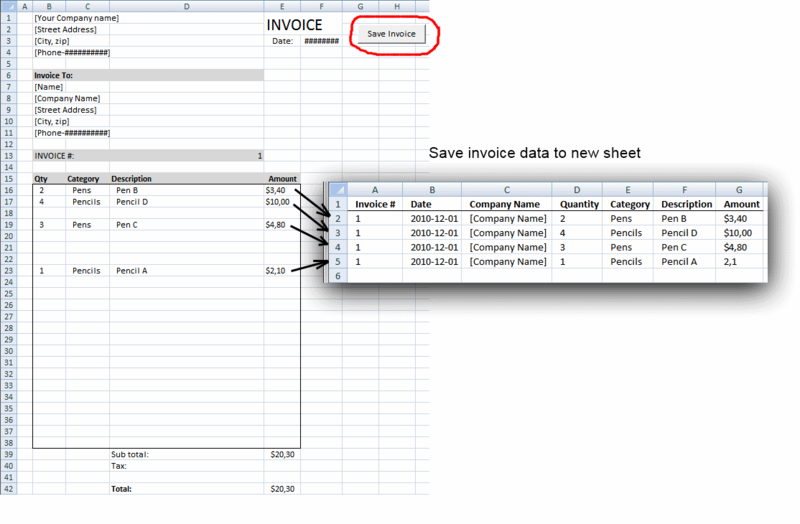 can you provide an example of your sheet? I am new to Excel with VBA code.. I have 1 excel with 2 sheets ( A.xl contains 2 tabs Name and Rating ). 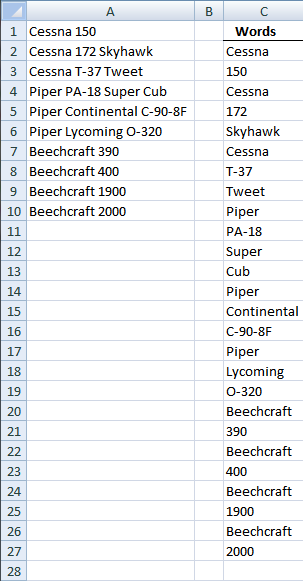 I want to read the datas from 2 sheets (Name and Rating) and appened the data in other excel file.. This code is working perfectly for me besides the fact that the macro stops splitting my table into different sheets once it reaches a field name longer that 31 characters. Is there any way I can work around this? Yes, I have uploaded a new file and changed the post. Lovely! Thanks so much Oscar. i have a file of 60000 row where i want to split in different sheet. each sheet will be 100 row i need a code in macro's. Thanks for this code its a great help. One question though: if I was adding more items to the original list how can I get it to just add these to the tabs rather than relisting the entire inventory again which ends up repeating records? I've been trying to add a "ClearContent" command in but I can't get it to work. I am not sure I understand. Upload your file here. Sorry If I wasn't being clear. 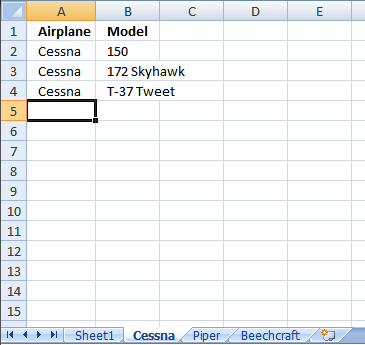 Take your example, if you added a few more planes to your original list, then hit the button again, it runs through the macro again but rather than adding only the new additions to appropriate lists, it will relist the whole list (with the new additions) after the original list on each worksheet. 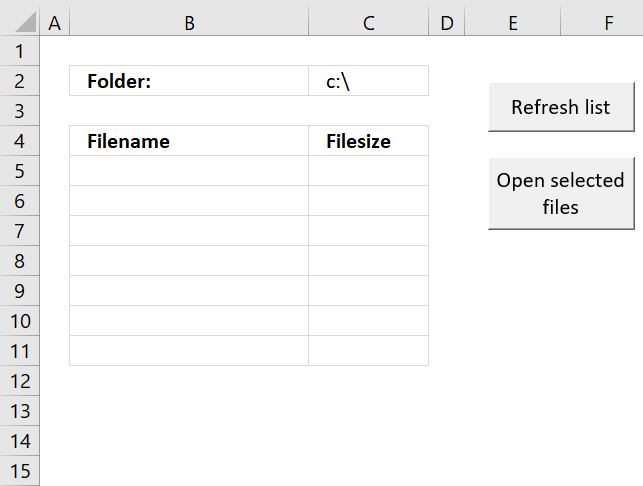 I worked around this by adding a remove duplicates instruction at the end of the instruction before it loops through to the next tab, but it would be good to know where I could have added something like a Clear.Contents, or Delete function, before the sheet was repopulated on pressing the button again. Your macro works great! Thanks for posting! 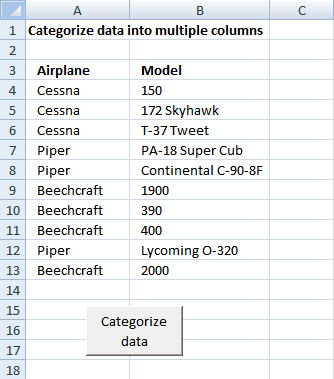 This seems to be working for me but in our data files we always have the table starting with the header row first cell in A1. I haven't quite figured how to change the rages in the code to get it to properly copy the header row to each of the sheets it creates? It would seem this should only require changing the named ranges? Hey, many thanks for this very useful macro, I have adjusted it to my work... whats the deal after this and why i need help in it? 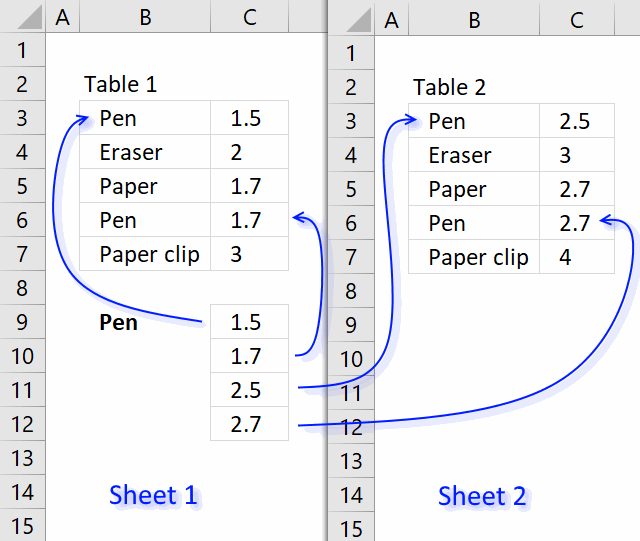 After that i just need to use it again in the same sheet, for example, for new data in f4:i4 and to split it for the sheets created in the first time. sorry for my english and many thanks in advance. I have a worksheet, I want to add a value to first data of first column my worksheet and then to split data upon on this operation into other worksheets. Thank you, Mr. Oscar for the code! You save our life and you make our life easier because we almost fall into the trap of being manual excel labour. Wish you a healthy and happy life! Thank you for commenting, I am happy it saved you time.